This bottled koozie is a notch above your typical koozie! Made up of canvas that will keep your favorite beverage cool longer & is built to last!! "FLORAL PRINT SMALL BAG" is sized specifically for daily small essentials carried. This is perfect two bottle wine carrier bag. If you're bringing brew, you want them to arrive cold and ready. Load up your favorite six pack into this caddy. The pockets stretch to fit everything from cans to longnecks in any combination. The thick soft canvas will keep your beer cold for hours. This tote bag having white flower with red color. The bag is perfect to carry all your essentials. It is a pleasure to carry on your shoulder proportionately making it a style statement. This tote bag has a beautiful design to compliment your style. Made for stylish, practical travellers like you. This crossbody bag have got ethnic look. Truly a multifunctional canvas crossbody bag having a front pocket and adjustable shoulder strap. The hairon stripes with different-different color shades make the bag really look chic. Large capacity leather tote that can hold books, laptop, notes and other things you daily use. You can use it as shopper tote,business tote,work tote,teacher tote,school tote bag,daily tote. . IF you are looking a Big tote/handbag, this handbag you deserve it. This bag features distinct vintage style that you are looking for. The bag is completely made up of 100% genuine leather and hairon. This smart leather bag comes with classic design. Suitable for you to carry it in daily-use, such as shopping, dating, working, traveling and so on. Carry your mobile phone, wallet, cosmetic, IPAD, umbrella and other daily things. 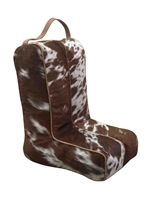 White and brown patches of cowhides Tote Bag is uniquely bi-segmented cow-hide having a zipper closure top. Dimensions of Bag are generously optimized. The weekender having the cross design rug and the cow-hide looks perfect for the weekend. The canvas that these fashionable bags are made out of is smooth and thable. Complete roomy interior with extra large interior compartments, have your twins and family all packed up with room for their daily necessities or even for long distance travel. Duffel is professional enough for an overnight business trip, small enough to carry on the plane, and practical enough to bring to the gym.detachable, padded and adjustable shoulder straps for added comfort. The leather & hairon boot bag is the comfort. Keep your shoes separate from clothes. Zipper design makes it easy to close and open.